We Are Pharaoh is Robert Fernandez’s first collection of poems, published in 2011 with Canarium Books. In this collection, we find ourselves located in a lush and tropical landscape; however, this landscape becomes quickly complicated by a fragmented lyric that ensnares all that crosses its path. While Fernandez’s poems are entangled in broad themes such as the lyric, human history, art, and the Sublime, the poems of this collection are primarily concerned with the cyclical and conflicted nature of upheaval. Although it seems impossible for one collection of poems to effectively reconcile so many disparate and limitless themes, Fernandez succeeds in creating a sense of cohesion. There is an inexplicable awe and certain joy that radiates from We Are Pharaoh as Fernandez tasks us with the challenge of tracing and teasing apart his root-like lyric—“A tangling of fruits and vases” where “the shade is verboten.” In this act of tracing, and “if [we] were to succeed,” we may discover what truths may lie “in blinding sunlight” above the foundation of this collection (84). Landscape plays an essential role in the creation of lyric fragmentation that pervades the poems in We Are Pharaoh. Throughout the collection, Fernandez’s poems are in conversation with specific works of art by artists such as Velázquez, Sir Stanley Spencer, Botticelli, and others. The first such ekphrastic reference appears in “Polyhedron,” which is the first poem of the collection. Fernandez states, “Think of the bardo as forty-one or 2,700 intersecting tiles. The mosaic has a fundamentally Caribbean soul. The under-flesh of a fugue, of cosmic background radiation” (3). A polyhedron, like a mosaic, is a solid figure that possesses many faces. Given this definition, Fernandez subtly steers us to a method for reading his fragmented and comparatively mosaic-like poems; similar to a fugue, each fragment is an inchoate face or theme that gains definition when considered not as part, but as whole. The emergence of many roots or motifs throughout Fernandez’s collection is in direct conversation with the book’s title: We Are Pharaoh, which posits the notion of unity. While the lyric implies singularity—the lyric “I” versus the lyric “you”—the title signals a collective, represented by “we.” In this sense, the individual is pitted against the collective; the act of which suggests a struggle or upheaval in which absolute power is ultimately yielded to the collective. In this sense, art serves to represent the collective that is present within this collection. In the poems’ ekphrastic moments, Fernandez often chooses to engage with landscape paintings by artists not known for their work with landscapes. In this detail alone there is an act of upheaval in the refusal to reinforce a dominant narrative. A common thread that runs throughout these paintings is the emphasis of background over foreground. 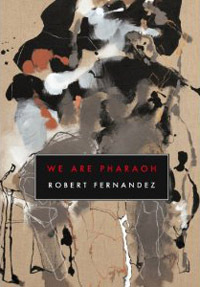 In these works, background becomes foreground; similarly, Fernandez utilizes the practice of background as foreground throughout the poems in We Are Pharaoh, and in doing so creates an endless struggle in which the many voices present in Fernandez’s lyric are caught in a violent cycle: emerging only to be again subdued. While many of Fernandez’s ekphrastic references will not be common knowledge for most readers, the gesture feels genuine. These references seem synesthetic in nature; they exist not because the poem seeks to describe these works, but rather because the landscape of the poem is reminiscent of the colors, textures, and qualities of composition depicted in these works of art. These references seek to create cohesion through visualization. However, this attempt to create unity proves contradictory in that these references also fork in another direction: toward an upheaval of the poems themselves. If Fernandez’s gesture is genuine, the involuntary emergence of art within the poems results in a disruption of the poem’s system. Being active, on the tips of its toes, forking, conversational (best accosted from the side), being hyper-national, elevated, sunk, being foundational, fanning to structure, being hostile, dormant, couched in retreat, being soft vein, mouth, soil and horizon, being disaster and re-architect, plumed through its length, being cluster, spore, sprawl, design and concurrent enaction, being fiber, thirst, hormone, cymbal, lattice and stress and sleeving unity…(26). For Fernandez, the root is rhizomatic. The rhizome is a system that allows for multiple, non-hierarchical points of entry and exit into a given body or structure—which root do we trace and where does it lead? The root is also, and perhaps more importantly, a system capable of creating both destruction and unity. The root may create destruction through upheaval—disrupting sidewalks or other solid structures that may lie above—or unity by holding soil and other disparate elements together, preventing erosion. We Are Pharaoh performs both the act of upheaval and the creation of unity; the realization of which creates an undeniable and compelling tension that renders the work nearly organic and very much alive: a body whose creator has given over his power so that the work may define and redefine its own values. Bethany Prosseda is an M.F.A. student at the University of Colorado at Boulder where she also teaches. She has work forthcoming with Rain Taxi.